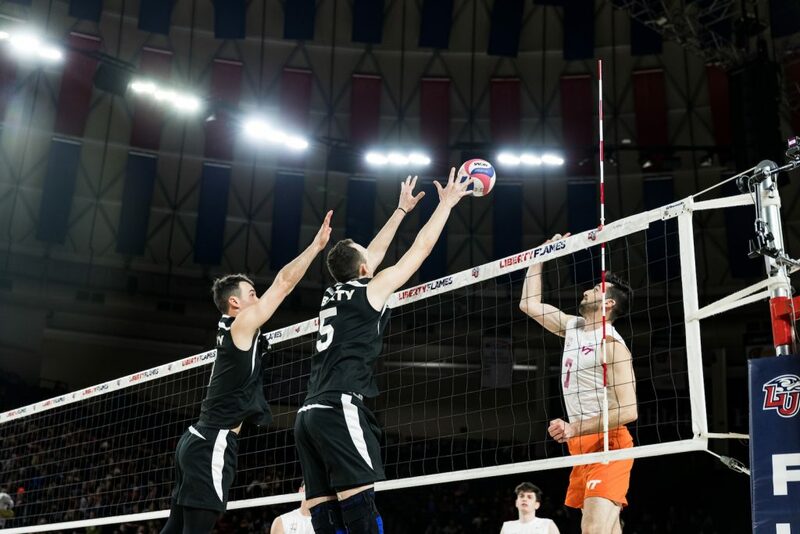 The Vines Center was alive with Midnight Mayhem at 11:59 p.m., Feb. 1, when the Flames men’s volleyball team took down the Virginia Tech Hokies 3-1. The win was Liberty’s first game of the spring semester after coming out of a strong 16-2-3 fall season. Tech came on strong in the first game, barely pulling out the win 27-25 as the night waned on. The Flames didn’t let the early win stop them from playing hard, however, as they came back in full force to win the second game 25-21. Liberty was led by freshman opposite hitter Joshua Knapp and senior outside hitter Brady Quakenbush, both of whom led the Flames out early with several kills. Sophomore outside hitter Sean Taggart finished off the second game with a hit off of a Tech block. Taggart carried his momentum into the third game as well, pulling the Flames up to 12-12 after an early Tech lead. BLOCK — The Flames are hoping to be ranked in the top ten and compete nationally this season. Knapp helped keep the score tied as Tech worked its way ahead to 14-14, soon followed by a four-point service run by Flames senior setter Kaden Knepper. The Flames held the Hokies off for the rest of the game, pulling ahead from 18-14 to 23-18. The third game ended 25-21 on a block from senior middle hitter Gene Dejesus. The fourth game featured a debut from freshman outside hitter James Morton, who started on the Flames DII team in the fall. Morton proved his skill in the fourth game with a series of fast kills, helping the Flames out to an early 10-4 advantage. The Flames only have four games left until the Eastern Collegiate Volleyball Association South Championships, which will be held Mar. 23 at Virginia Tech. After that, Liberty will turn its eyes to the National Collegiate Volleyball Federation nationals.